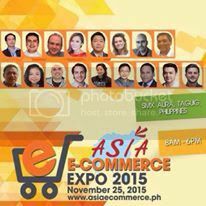 Asia E-Commerce Expo 2015 (#AECoE) is happening at SMX Convention Center, Taguig from 8AM to 6PM on November 25, 2015. More than 20 speakers and 300 attendees are expected, plus 30 exhibitors will showcase their products and services at the expo. #AECoE aims to empower and inspire the startup innovators and traditional organizations to adapt E-Commerce and to learn from sessions and discussions about EPrivacy, Elogistics, EPayments, Market Analysis, Digital Marketing, CRM, Strategy, E- Commerce and Going Global. Ten (10) Startup Innovators who submitted their profiles to #AECoE will be given a chance to talk about their organizations. Each startup company will have 5 minutes to present their innovation, company profiles, and products and services to everyone. This will give them a chance to meet prospective business partners. Those interested in the “Pitch In” Session can still submit their profile on or before September 30, 2015. The chosen companies will be included in the program/agenda. Registration fee is Php 3,000.00 inclusive of the following: snacks, elegant buffet lunch, conference and expo. 1. Deposit the registration fee to TAG Media and Public Relations BPI Checking Account # 1680 0010 29. 3. Send the scanned copy to maria@asiaecommerce.ph. For more information, please visit http://www.asiaecommerce.ph. For partnership/sponsorship inquiries, you may contact the organizer at 09166299381 or at maria@asiaecommerce.ph. This entry was posted in #AECoE, Asia E- Commerce Expo 2015, CRM, Digital Marketing, E- Commerce, Elogistics, EPayments, EPrivacy, Going Global, Market Analysis, Press Release, Strategy. Bookmark the permalink.